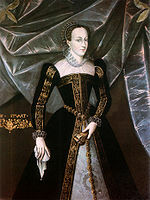 Mary, Queen of Scots dia teraka ny 8 Desambra 1542 ary maty ny 8 Febroary 1587. I James V of Scotland no rainy. Ny vadiny dia Francis II of France, Henry Stuart, Lord Darnley, James Hepburn, 4th Earl of Bothwell. Ny zanany dia James VI and I.
Voaova farany tamin'ny 27 Mey 2018 amin'ny 14:21 ity pejy ity.